Fat-Free Pumpkin-Apple Angel Food Bars. © Barbara Rolek licensed to About.com, Inc. 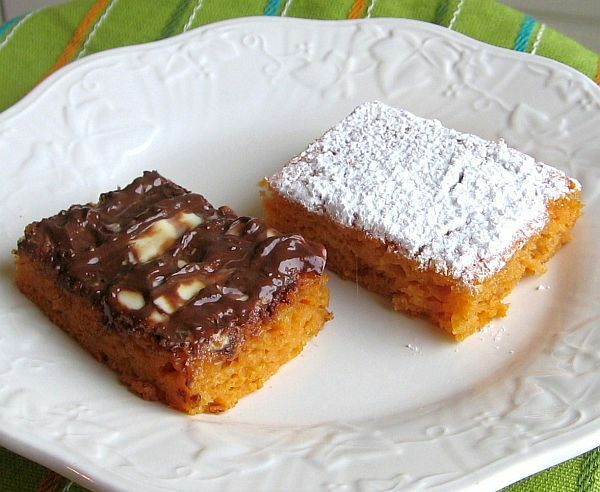 I developed this Easy Fat-Free Pumpkin-Apple Angel Bars recipe while surfing the Internet. I kept running into recipes for Lemon Angel Bars. But I was faced with a can of pumpkin purée and applesauce instead of lemon pie filling, so I thought I'd give my version a whirl. It's delicious, fat-free and its orange color is so festive looking, especially for kids' Halloween parties and those watching their fat grams on Thanksgiving. And it couldn't be easier because it's made with just three ingredients -- angel food cake mix, pumpkin purée and applesauce. That's it! And it comes together, from the time you open the can to the time it comes out of the oven, in 30 minutes. Don't expect this to taste like pumpkin pie, the crumb is light and airy like angel food cake. To keep it completely fat-free, dust with confectioners' sugar, otherwise a drizzle of melted chocolate is a nice touch. See the list, below, after the recipe directions for more low-fat or fat-free Thanksiving dessert options. Heat oven to 350 degrees. Coat a 15x10-inch jellyroll pan with cooking spray and set aside. In a large bowl, whisk together pumpkin and applesauce, and spices if using. When well combined, whisk in the angel food cake mix until no streaks of mix remain. Pour batter into prepared pan. Bake 25 minutes or until cake tests clean (begin testing after 20 minutes). Remove from oven and cool completely on a wire rack. Dust with confectioners' sugar. Or, to satisfy both factions, while the cake is still hot, sprinkle a combination of white and semisweet chocolate chips on half of the cake. Wait a few minutes and then spread the melted chocolate over half the cake, creating a marble effect. When completely cool, cut into squares and serve.